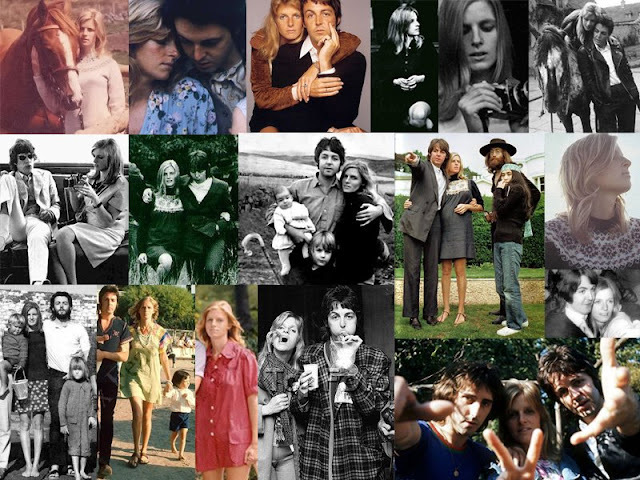 Growing up, Linda McCartney was my idol. My first real exposure to her was on an episode of “The Simpsons” I watched with my older brother when I was around five years old. Her and Paul made voiced “guest appearances” on the show where they spread the message of vegetarianism. This episode caused my taste for meat to decrease greatly and I think it was one of the earliest things that influenced my decision to give up meat permanently only five years later. My parents are baby boomers, so they grew up with Beatlemania and the after-years, and made the music they grew up with an integral part of my youth. I remember dancing along to my mom’s original Wings albums and thinking it was so cool that this girl from New York had made it into a British super-group. Linda, who openly said that she never desired a music career and only joined Wings at Paul’s insistence, performed keyboards and vocals during the band’s decade-long tenure. She also co-wrote some of the band’s biggest hits her with husband; both she and Paul were nominated for an Oscar for their song “Live and Let Die,” and Wings won many Grammy awards throughout the 70s. Despite the many successes Wings had, Linda still had to put up with jibes about her newfound musical career and criticisms about her singing being out-of-tune. Linda apparently told her close friend Danny Fields, (as repeated during the A&E Biography of the Beatles’ Women) “I don’t want to be here, I want to be home with the horses and the children and the garden. I can’t play piano – everyone knows it. They laugh at me, they write about me, they make fun of me.” But eventual as her musical talents grew, Linda was able to make light of her inexperience, calling her singing sub-par in the beginning and claiming that in terms of her piano-playing, “there’s high-schoolers who could do better.” For me, a child with no musical abilities, Linda represented what I thought was impossible – even though she had to endure all those rude remarks about her singing, she still won many Grammys and other awards – because of Linda, I could now add international rock star to my list of possible careers. So deep was my respect for Linda, I even accepted the fact that she was married to my future-husband Paul because I understood she was a good person, which was no easy feat for a lovelorn seven-year-old. Linda McCartney was also an outspoken activist, particularly for animal rights, lending her support to organizations like PETA, Friends of the Earth, LACS, among others. She also was a vegetarian for the majority of her life. Of her meatless lifestyle, Linda said that she wouldn’t “eat anything with a face” and said that if more people understood the goings-on of slaughterhouses, “the whole world would be vegetarian.” After introducing her husband to vegetarianism in 1975, she founded a business with hopes of further promoting vegetarianism. She started the Linda McCartney Foods company, where she published many cookbooks containing only meatless recipes and sold frozen vegetarian meals; both endeavors proved to be very successful and made Linda financially independent from Paul. In 1995 Linda was diagnosed with breast cancer, losing her battle with the disease three years later. She passed away in April 1998 at only 56 years old. I remember the day Linda McCartney passed away – as pathetic as this may sound, her passing was my first real encounter with death and it absolutely devastated me. I may have only been a child, but the genuine feelings of melancholy were not lost on me. Even though I didn’t know her, I felt like I had lost someone who was very much present in my life. The ways in which Linda presents herself in my life unfortunately does not exclude breast cancer – both my mother and grandmother have been diagnosed with cancer in the last four years, and I live with the possibility of inheriting the disease. In a lot of ways, I can relate to Linda and look to her as my role model. She proved herself to be an esteemed and talented photographer who succeeded in making a name for herself apart from the merits of her husband’s work. She also was an animal rights activist who spread the benefits of a meatless lifestyle with the world, and was probably the most famous reluctant rock star of the twentieth century. In her honor, PETA created the Linda McCartney Memorial Award after her passing in order to commemorate those who make strides to protect animal rights. Linda also inspired some of her husband’s most tender love songs, including: “The Lovely Linda,” “Maybe I’m Amazed,” “I Will,” “I’ve Got a Feeling,” “Two of Us,” and “My Love.” Paul McCartney also said that after Linda was diagnosed with cancer, the meaning of his song “Little Willow” – originally dedicated to Maureen Starkey, the late first-wife of Ringo Starr – also became true for Linda. Rest in peace Linda; your wonderful legacy lives on through your activism, your photography, and the lessons you taught your four children and husband, who all still carry on your message.